To begin this road trip, you will fly into the beautiful city of San Francisco, California, where you will rent a car and begin your trip. If you have time, I would suggest spending a few days in San Francisco as the city itself is beautiful with a lot of amazing things to see and do. One of the more scenic places in the San Francisco area is the first stop on our itinerary after leaving the city. Muir Woods National Monument is home to some of the largest Redwood trees in the United States. You will be blown away at how tall these trees can get. Take your time exploring Muir Woods National Monument and the surrounding coastline. In addition to the Redwood trees, I would suggest checking out Muir Beach, the Marine Mammal Center, Point Bonita Lighthouse, and Point Reyes National Seashore to the North. When you have finished exploring the Muir Woods area, you will drive South of San Francisco to your next stop at Pinnacles National Park. Pinnacles National Park has some of the most beautiful rock formations in the state of California. In many ways, it reminds me of Bryce Canyon National Park in Southern Utah. Have your camera ready as you will definitely want to photograph the beautiful landscapes inside the park. When you are done enjoying the scenery in Pinnacles, you will next head Northeast to arguably the most well known national park in California. Yosemite National Park has been on the world radar ever since the famous conservationist John Muir wrote about its beautiful valley and massive granite rock faces over a century ago. Today, Yosemite National Park is one of the most prolific rock climbing destinations in the world. It is also home to some massive Sequoia tree groves, which adds to the allure of this amazing park. You will want to spend at least a few days exploring Yosemite National Park before moving South to your next stop at Kings Canyon and Sequoia National parks. Some of the biggest trees in the world are located in Sequoia National Park and you will marvel at the girth of these giants when you visit Kings Canyon and Sequoia National Parks. The parks are in very close proximity to each other, so spending a few days in the area to explore is recommended. When you have finished exploring, you will head further South towards Santa Barbara, California and the Channel Islands National Park. The Channel Islands are known for their abundance of marine wildlife. There are a plethora of tours that will take you around the islands, and some will even let you stop and hike on the islands themselves. I would strongly recommend spending some time on the ocean to see the wildlife, with whale watching tours being one of the most popular options. When you have had your fill of the Channel Islands, you will next head due East to the Mojave Desert and Joshua Tree National Park. Renown for its high concentration of beautiful Joshua Trees and the unusual rock formations that scatter its landscape, Joshua Tree National Park is one of America’s most beautiful desert parks. If you are up for some adventure, you can even try your hand at some rock climbing, which is what the park is world renown for. The final park on your road trip is certainly not the least famous. Death Valley National Park, which lies on the California and Nevada Border and is one of the lowest places on Earth. Known the world over for its scorching hot temperatures, extremely dry climate, and beautiful desert landscape, Death Valley is a treat for park enthusiasts. When you have wrapped up your visit to Death Valley National Park, you will head across the border into Nevada towards Las Vegas where you will finish your trip. You will return your rental car and fly home, but not until after you have enjoyed some time in Las Vegas. In addition to the Vegas strip, the Las Vegas area has an abundance of other activities for tourists to enjoy. 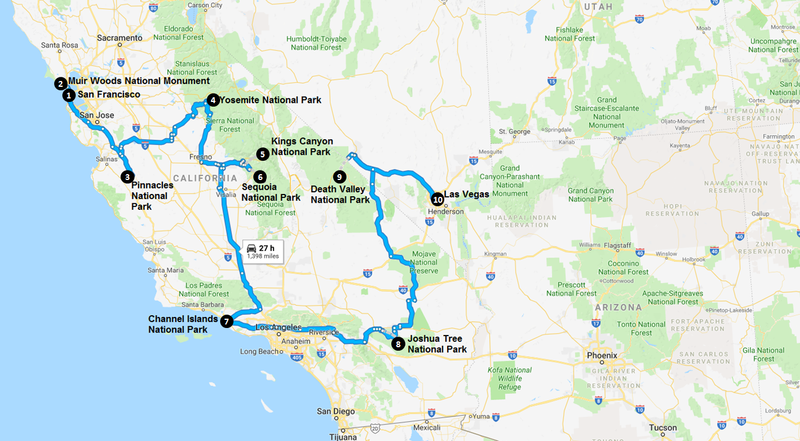 Considering the fact that the road trip includes roughly 27 hours of driving, I would recommend planning to spend at least 12 days on this trip, if not a full two weeks. You are going to want to spend ample time at some of the bigger parks, especially if you want to do some hiking and see everything the parks have to offer. After arriving in San Francisco and spending some time to see the city, you will head just North of the city to Muir Woods National Monument. Muir Woods has some of the tallest Redwood Trees in North America, so prepared to be amazed by their size and beauty. I would suggest planning to spend an entire day the Muir Woods as there is quite a bit to do in the area. In addition to Muir Woods, the adjacent Point Reyes National Seashore is beautiful and worth seeing as well. After exploring the Muir Woods National Monument and surrounding area, you will next head South to Pinnacles National Park. Pinnacles National Park protects some of the most breathtaking coastal mountains that you will see in North America and includes some of the most beautiful rock formations that you will see outside of Bryce Canyon National Park. It is also one of the newest national parks in the United States as it only became national parkland in 2013. The next stop on the itinerary is to one of the United State’s oldest and most famous national parks, and certainly one of its most beautiful as well. Yosemite National Park is world renown for its gigantic granite rock faces, which climbers from all over the world come to Yosemite to climb. The park also offers some of the most magnificent hiking routes in the United States, with the legendary John Muir Trail going thru some of the most beautiful sections of the park. I would suggest spending at least a few days in Yosemite as there is so much to see and do in the park. After visiting Yosemite, you will turn South and head towards Kings Canyon National Park. In Kings Canyon, you will find a number of old growth Sequoia tree groves. These are some of the largest trees in the world and will make your jaw drop when you see how big they are in person. Make sure you stop by the gigantic General Grant Tree in Grant Grove and check out the Cedar Grove, which is surrounded by towering granite canyon walls. Kings Canyon is in close proximity to your next stop, which is Sequoia National Park so I would suggest finding lodging in between the parks. If you didn’t get your fill of humongous old growth Sequoia trees in Kinds Canyon, fear not because Sequoia National Park has some of the oldest and largest in North America. When you visit Sequoia, make sure you check out General Sherman Grove, the underground crystal cave, and climb Moro Rock, which allows you to see for miles inside the park. I would also make sure that you drive thru the tunnel tree, which is an amazing experience. When you are finished exploring the park, you will head South towards Santa Barbara and the Channel Islands. The Channel Islands National Park is one of the United State’s most unique national parks and is the next stop on your road trip. To tour the park, you are going to want to book a tour with one of the local tour companies. I would strongly recommend Island Packers Cruises as they have some really amazing tour packages. They have tour packages that access the islands as well as cruises to view the marine wildlife such as whale watching cruises. Once you have had your fill of amazing boat rides and marine wildlife, you will head East and travel inland towards Joshua Tree National Park. Joshua Tree National Park is one of the United State’s most underrated national parks in terms of its beauty and the number of adventure activities available. This beautiful desert landscape is home to the highest concentration of Joshua Trees in North America and is also a premier rock climbing destination. If you are looking for a rock climbing guide in the Joshua Tree area, there are plenty of good ones available. The last national park stop on your road trip is one of the United State’s most well-known parks that is located in one of this world’s most well-known deserts. After visting beautiful Joshua Tree National Park, you will head back North and towards the Nevada Border. Here you will stop at Death Valley National Park. As one of the lowest and hottest places on Earth, Death Valley has a mean reputation. However, it is also incredibly beautiful. Make sure you take enough time to explore the park, but also make sure you have plenty of water on you at all times. After exploring Death Valley, you will head East to Las Vegas, Nevada where you will conclude your trip. You will return your rental car and catch a flight home, but not until after taking a day or two to explore this exciting city. In addition to gambling, Las Vegas also offers a wide range of exciting shoes, some premier golf courses, and many other exciting things to do. While this road trip is a trip that you can take all year-round, there are some months of the year that are better than others. For instance, if you take the trip during the Summer months of June thru August, you will have to deal with scorching hot temperatures in Joshua Tree and Death Valley National Parks. However, if you decide to take the trip in the Winter months of December thru February, you may have to deal with snow in the alpine sections of Yosemite and King’s Canyon national parks. For these reasons, I would suggest you look at taking this road trip either during the Spring months of March thru May or the Autumn months of September thru November. You will have much more moderate temperatures in the desert parks and you are less likely to get snowed out of the mountain parks. A great post with beautiful pictures. I’d never heard of a few of those parks – Pinnacles and Channel Islands in particular – so thanks for bringing me up to speed. No problem! I was supposed to go to the Channel Islands when in Cali, but weather didn’t permit. Amazing whale watching. If you visit, go during blue whale season. My brother says it is absolutely incredible.